On the cold Monday of the 2018 ALA Midwinter Meeting, 21 people gathered together at the Denver Public Library for the workshop “Applying DCRM(MSS): Descriptive Cataloging of Rare Materials (Manuscripts).” Led by Alison Bridger (Wisconsin Historical Society), Jennifer Nelson (University of California, Berkeley), and Margaret Nichols (Cornell University), this workshop was presented by the Association for College and Research Libraries (ACRL) Rare Books and Manuscripts Section (RBMS) Workshops Committee. The goal during this full-day workshop was to learn the new iteration of DCRM(MSS), the national cataloging standard for manuscripts. 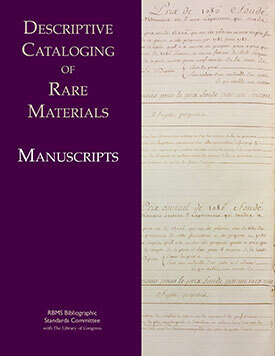 Workshop topics included the manual’s guiding principles, how manuscript cataloging differs from the cataloging of published materials, and an introduction to the treatment of major elements of the catalog record (such as the title, place of production and date, and extent). Workshop activities included discussion of DCRM(MSS) and hands-on practice in applying the standard. The workshop began by describing the unique nature of manuscripts. The workshop leaders defined manuscripts as the “byproduct of human activity”—whether that be a grocery list, letter, or handwritten draft of a poem. When catalogers catalog monographs and other print material, the record represents a shared item and the record can be used or enhanced by others. But with manuscripts, the likelihood of the record being reused is low because these are one-of-a-kind materials. That being said, manuscript records can serve as templates, and other catalogers can base their new records on a previously created one. From there, Bridger, Nelson, and Nichols highlighted each important aspect of the record according to the revised cataloging rules—from identifying creators and titles to the all-important notes fields, which describe what makes each manuscript truly unique. Also discussed was the ever important role of cataloger’s judgement—what a cataloger can do to aid the researcher in finding these materials at a later time. To answer that question and more, the workshop involved several hand-on exercises: creating devised titles, deducing the statement of responsibilities, and more. After each, there was an opportunity to share individual answers and receive feedback from the workshop presenters. At the end of the day, a longer Q&A session allowed for all questions that had gone unsaid to be aired.